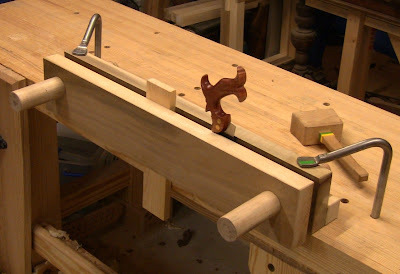 My Moxon double-screw vise, based on Chris Schwarz's design. 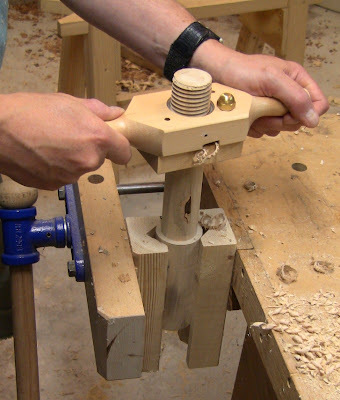 Chris Schwarz did several blog posts last year about building a version of Joseph Moxon's "double-screw vise". I immediately wanted to build one. 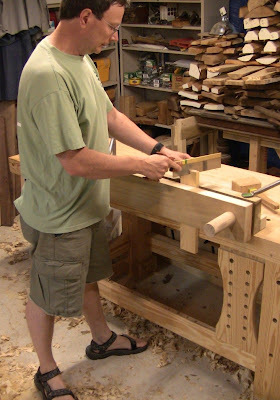 He refined his initial design, resulting in an article in the December, 2010 issue of Popular Woodworking. 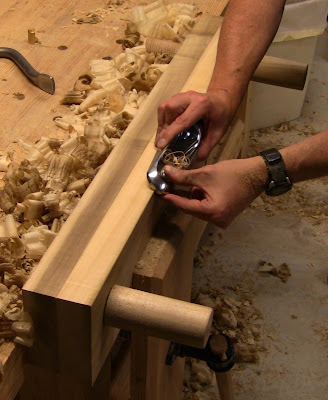 The purpose of this vise is to secure and elevate the ends of boards when sawing dovetails at the workbench, so that you don't have to lean over. By now a number of people have built it. I recently built a bench-on-bench, another solution to the same problem. So why build this one? I like to know the different ways of doing things. You never know when something will prevent you from working the way you usually have. This can be made up from scraps around the shop. 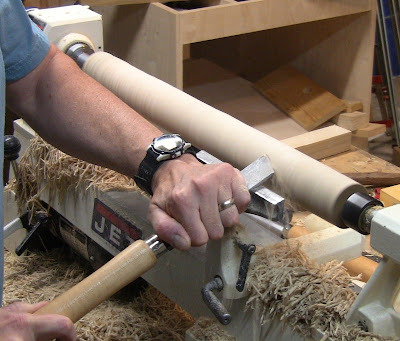 The hand-screws are turned on the lathe and then threaded with a thread-box. 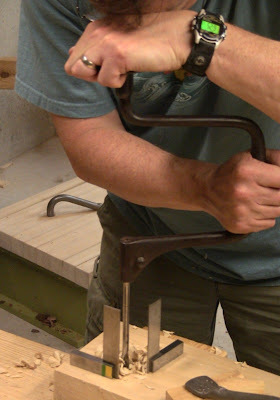 The corresponding holes in the vise rear jaw are threaded with a maching tap. The screws were the main source of my delay in building this, since I had to work on developing my turning skills. I'm now able to rough a blank and smooth it, all with just a skew. I ordered the threading set from Garrett-Wade, using the gift certificate my parents had given me for Christmas. This maple came from a co-worker's backyard along a stream in 2006. He had already cut it to firewood length. 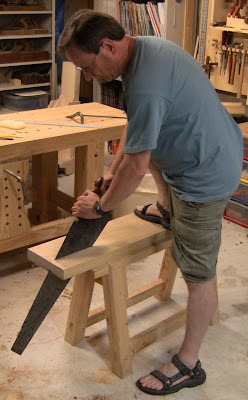 I split it with wedge and sledge, then quartered the halves on the bandsaw and stacked it in my basement. After 5 years, it's nicely seasoned. It's fun to be using wood I harvested. Trimming up one of the quarters for a turning blank. The blank mounted up. I could have put more effort into squaring it up for better balance, but there's really no need. At lowest RPM, starting to rough it in with the skew. 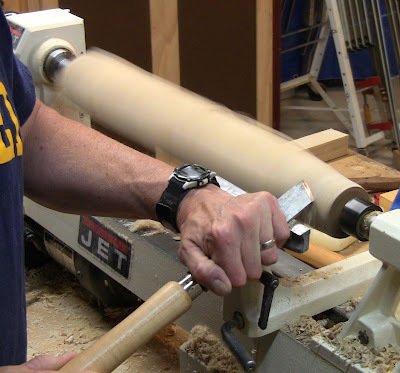 Now at higher RPM, planing with the skew to smooth, uniform diameter. 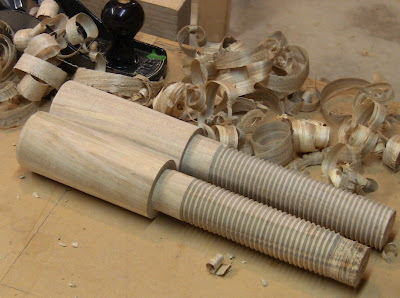 The completed turning. 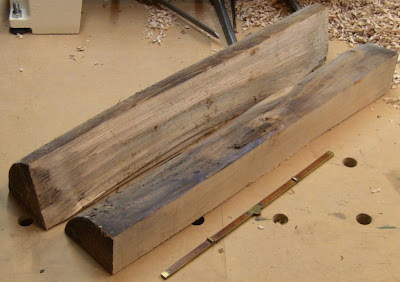 Note the defect in the wood along the section to be threaded. This will cause some voids in a few threads, but shouldn't be a problem. The second blank did require a little more work to prepare. 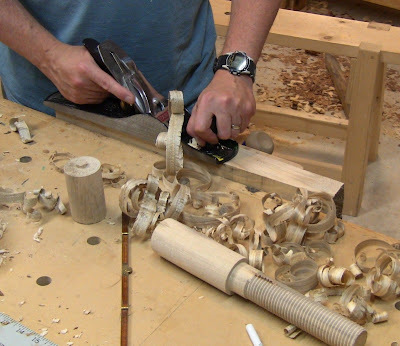 Using a jack to take heavy shavings and quickly square up the shape better. You can see the first screw finished, the defect in the wood wasn't too bad. The second screw proved more difficult than the first. When I started the thread-box, it was too tight. I put some oil on the wood for lubrication, but it still took too much force to the turn the thread-box. It cut the first few threads, but then wouldn't advance. It ended up completely stripping out the threads. I hadn't gotten the screw quite down to the proper diameter. Since I had already cut the ends off the turning, I had re-find the centers to remount it on the lathe. It had a bit of wobble, but not enough to be a problem. I took it down another 1/16" or so in diameter, then was able to thread it. So in general, it seems better to err on the side of too small. The two finished screws. You can see the stripped out threads on the end of the one in front. 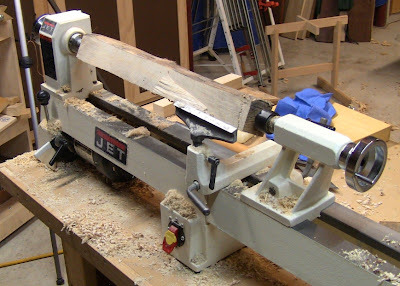 Ripping down some poplar 1 3/4" stock for one of the vise jaws. Boring the 1 1/2" hole in the front jaw using an expansive bit and large Spofford brace. This worked fine...until the spur of the bit snapped off. The cutting edge still worked, but without the spur to cut the outer diameter, the cutter was gradually force into a smaller diameter with each crank of the brace. I had to switch to a forstner bit in a portable power drill. Tapping the 1 3/8" hole in the rear jaw. The tap is lubricated with salad bowl oil. 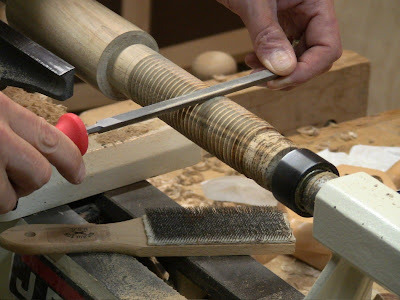 The gloves are necessary because this takes some force, and the small diameter of the cross-bar handle that provides the torque is hard on the hands. Fine-tuning the first screw. It threaded into the jaws nicely with a little paste-wax on the threads, but the final unthreaded portion was a little too large in diameter. I rasped it down with a plane float as I rotated the handle. 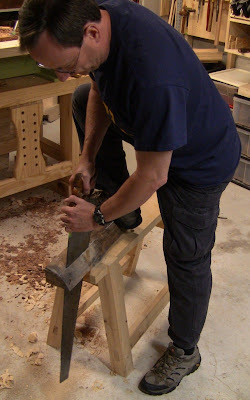 With both screws in place and before adding the rear brace piece, planing the top of the jaws even. Chamfering all the edges. Note the new pile of shavings! I added the rear brace, secured with glue and screws, and tested it out. Secured to the bench with holdfasts, it works very nicely, holding the work piece solidly and presenting the end at a comfortable height. However, the second screw continued to give me problems. It was much harder to turn than the first one. More paste wax didn't help. Looking more closely at the threads, I could see they weren't cut as well as the first ones; they were fatter, so bound up in the tapped threads. I'm not sure why, maybe I was pushing down too much using the thread-box, making it advance too fast. Or maybe because I had reduced the diameter, the thread-box pitched a bit to one side as I turned it, leaving threads too wide. I considered just making a new screw, since the end threads were already torn up, but I had an idea. Perhaps if I could file the threads down a little thinner, they would fit better. I mounted it back up in the lathe and used minimum RPM while running a triangular file down them. This worked great! After a few tries, the screw turned just as easily as the other one. Chasing the threads with a triangular file to narrow them. As I run the file forward, the spinning threads carry it down the length of the screw in just a few seconds. It takes multiple passes, first angling the file to the leading face of the threads, then the trailing face. The file card sitting on the lathe bed cleans the file of dust and paste-wax. 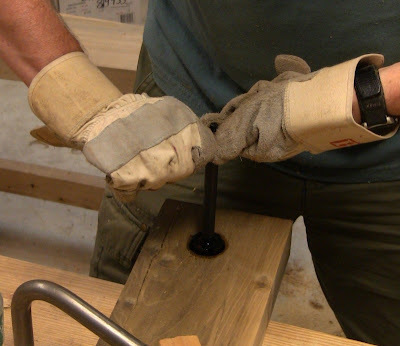 The completed vise in action. Note my comfortable upright stance, with elbow just over 90 degrees. The workpiece is absolutely solid, no movement or vibration. 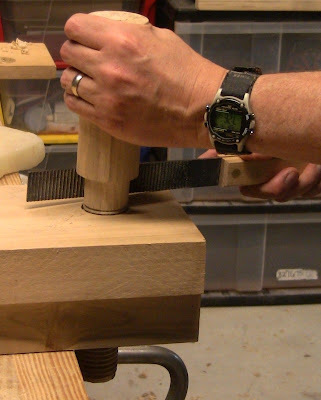 I made myself one of these about a year ago, my original thoughts were it would be used for dovetail cutting and that was about it, but I was wrong, I find myself reaching for this baby as a solution to all kinds of problems. I'm considering building another smaller version than my first. As I recall the turning was a very particular part of the process. You have an excellent solution to fixing some too tight threads. 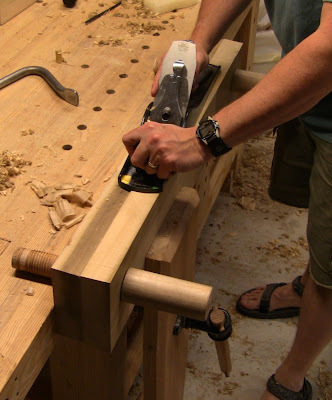 Just found your blog and looked in on how you built this vise. We built one in a class with CS, but it's nice to see someone go start to finish. 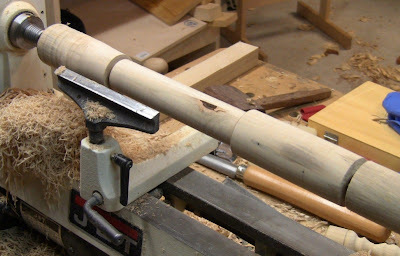 I need to learn some lathe/spindle turning. Great job. Looking at pictures of moxom double screw vies impressed by your safety boots are the standard in workshops in USA.